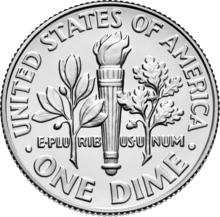 The word dime comes from the French word dîme, meaning "tithe" or "tenth part", from the Latin decima [pars]. In the past prices have occasionally been quoted on signage and other materials in terms of dimes, abbreviated as "d" or a lowercase "d" with a slash through it (₫) as with the cent and mill signs. The Coinage Act of 1792 established the dime (spelled "disme" in the legislation), cent, and mill as subdivisions of the dollar equal to ​1⁄10, ​1⁄100 and ​1⁄1000 dollar respectively. The first known proposal for a decimal-based coinage system in the United States was made in 1783 by Thomas Jefferson, Benjamin Franklin, Alexander Hamilton, and David Rittenhouse. Hamilton, the nation's first Secretary of the Treasury, recommended the issuance of six such coins in 1791, in a report to Congress. Among the six was a silver coin, "which shall be, in weight and value, one tenth part of a silver unit or dollar". From 1796 to 1837, dimes were composed of 89.24% silver and 10.76% copper, the value of which required the coins to be physically very small to prevent their intrinsic value being worth more than face value. Thus dimes are made small and thin. The silver percentage was increased to 90.0% with the introduction of the Seated Liberty dime; the use of a richer alloy was offset by reducing the diameter from 18.8 millimeters (0.740 inch) to its current figure of 17.9 millimeters (0.705 inch). With the passage of the Coinage Act of 1965, the dime's silver content was removed. Dimes from 1965 to the present are composed of outer layers of 75% copper and 25% nickel, bonded to a pure copper core. Starting in 1992, the U.S. Mint began issuing Silver Proof Sets annually, which contain dimes composed of the pre-1965 standard of 90% silver and 10% copper. These sets are intended solely for collectors, and are not meant for general circulation. Since its introduction in 1796, the dime has been issued in six different major types, excluding the 1792 "disme". The name for each type (except for the Barber dime) indicates the design on the coin's obverse. The Coinage Act of 1792, passed on April 2, 1792, authorized the mintage of a "disme", one-tenth the silver weight and value of a dollar. The composition of the disme was set at 89.24% silver and 10.76% copper. In 1792, a limited number of dismes were minted but never circulated. Some of these were struck in copper, indicating that the 1792 dismes were in fact pattern coins. The first dimes minted for circulation did not appear until 1796, due to a lack of demand for the coin and production problems at the United States Mint. The first dime to be circulated was the Draped Bust dime, in 1796. It featured the same obverse and reverse as all other circulating coins of the time, the so-called Draped Bust/Small Eagle design. This design was the work of then-Chief Engraver Robert Scot. The portrait of Liberty on the obverse was based on a Gilbert Stuart drawing of prominent Philadelphia socialite Ann Willing Bingham, wife of noted American statesman William Bingham. The reverse design is of a small bald eagle surrounded by palm and olive branches, and perched on a cloud. Since the Coinage Act of 1792 required only that the cent and half cent display their denomination, Draped Bust dimes were minted with no indication of their value. All 1796 dimes have 15 stars on the obverse, representing the number of U.S. states then in the Union. The first 1797 dimes were minted with 16 stars, reflecting Tennessee's admission as the 16th state. Realizing that the practice of adding one star per state could quickly clutter the coin's design, U.S. Mint Director Elias Boudinot ordered a design alteration, to feature just 13 stars (for the original Thirteen Colonies). Therefore, 1797 dimes can be found with either 13 or 16 stars. Also designed by Robert Scot, the Heraldic Eagle reverse design made its debut in 1798. The obverse continued from the previous series, but the eagle on the reverse was changed from the widely criticized "scrawny" hatchling to a scaled-down version of the Great Seal of the United States. The Draped Bust/Heraldic Eagles series continued through 1807 (although no dimes dated 1799 or 1806 were minted). Both Draped Bust designs were composed of 89.24% silver and 10.76% copper. In all, there are 31 varieties of Draped Bust dimes. Capped Bust dimes minted through 1828 are known as the Large type. This is partially because they were struck without a restraining collar, which gave them a broader appearance. In 1828, Chief Engraver William Kneass introduced the close collar method of coining (which automated the process of placing reeds on a coin's edge). In addition to standardizing the diameter of coins, the new method allowed the Mint to produce thicker coins. To maintain a standard weight and alloy, the diameter of most coins was reduced. In particular, the dime was reduced in diameter from 18.8 to 18.5 millimeters. This new Capped Bust dime, which began production in 1828, is known as the Small type. There are 123 varieties known of Capped Bust Dimes. Christian Gobrecht completed the design of the Seated Liberty dime, whose obverse was used with every circulating silver U.S. coin of the period. Mint Director Robert Maskell Patterson requested a new coin design, to be reminiscent of the Britannia image found on coinage of the United Kingdom. Chief Engraver William Kneass drew the original sketches, but suffered a stroke and was too ill to finish them or to oversee preparation of the dies. The task then fell to Gobrecht, who was promoted to Second Engraver. The obverse features an image of Liberty sitting on a rock, wearing a dress and holding a staff with a liberty cap on top. Her right hand is balancing a shield with the inscription "LIBERTY." The reverse featured the inscription "ONE DIME," surrounded by a wreath. All Seated Liberty dimes contain 90% silver and 10% copper, and are 17.9 millimeters (0.705 inch) in diameter. This size and metal composition would continue until 1965, when silver was permanently removed from circulating dimes. There were several minor varieties during the Seated Liberty's run. The initial design (1837) had no stars on the obverse and, further, the dates were minted in a Large Date and Small Date variety. These two types can be distinguished by noting the "3" and the "7" in the date. In the Large Date variety, the "3" has a pointed serif at top, and the horizontal element of the "7" is straight. In the Small Date variety, the "3" has a rounded serif, and there is small a knob, or bulge, in the "7" horizontal element. Only the Philadelphia Mint made both varieties. The Small Date is slightly rarer. The New Orleans Mint also made the Seated Liberty Dime in this year, but only in the Small Date variety. Thirteen stars (symbolizing the 13 original colonies) were added to the perimeter of the obverse in 1838. These were replaced with the legend "United States of America," which was moved from the reverse in mid-1860. At the same time, the laurel wreath on the reverse was changed to a wreath of corn, wheat, maple, and oak leaves and expanded nearly to the rim of the coin. This reverse design continued through the end of the series in 1891 and was changed only slightly in 1892, when the Barber dime debuted. Another variety is the 1838–40 dime minted with no drapery underneath the left elbow of Liberty. Arrows at the date in 1853 and 1873 indicated changes made in the coin's mass (from 2.67 grams to 2.49 grams in 1853, then to 2.50 grams in 1873). The first change was made in response to rising silver prices, while the latter alteration was brought about by the Mint Act of 1873 which, in an attempt to make U.S. coinage the currency of the world, added a small amount of mass to the dime, quarter, and half-dollar to bring their weights in line with fractions of the French 5-franc piece. The change also ensured the quarter dollar (which is valued 2.5 times the dime) weighed 2.5 times the dime (6.25g), and the half dollar (twice the value of the quarter dollar) weighed twice what the quarter dollar weighed (12.5g). In this way, a specific weight of these coins, no matter the mixture of denominations, would always be worth the same. This relation in weight and value continued in the cupronickel coins from 1965 on. This produced the greatest rarities in the Seated Dime Series, the 1873 & 1874 Carson City Dimes, with arrows and the unique 1873 Carson City Dime without arrows. The Barber dime is named for its designer, Charles E. Barber, who was Chief Engraver of the U.S. Mint from 1879 to 1917. The design was shared with the quarter and half-dollar of the same period. Extensive internal politics surrounded the awarding of the design job, which had initially been opened to the public. A four-member committee (which included Barber), appointed by then-Mint Director James Kimball, accorded only two of more than 300 submissions an honorable mention. Kimball's successor, Edward O. Leech, decided to dispense with the committees and public design competitions and simply instructed Barber to develop a new design. It has been speculated that this is what Barber had wanted all along. The Barber dime, as with all previous dimes, featured an image of Liberty on the obverse. She is wearing a Phrygian cap, a laurel wreath with a ribbon, and a headband with the inscription "LIBERTY". This inscription is one of the key elements used in determining the condition of Barber dimes. Liberty's portrait was inspired by two sources—French coins and medals of the period, as well as ancient Greek and Roman sculpture. The obverse also contains the long-used 13 stars (for the 13 colonies) design element. The reverse contained a wreath and inscription almost identical to the one used on the final design of the Seated Liberty dime. Dimes were produced at all four of the mints that operated during the period. While circulated coins of the entire series are readily available to collectors there is one outstanding rarity, the 1894-S Barber Dime. Twenty-four were minted, with 9 currently known. Although most commonly referred to as the "Mercury" dime, the Winged Liberty Head does not depict the Roman messenger god. The obverse figure is a depiction of the mythological goddess Liberty wearing a Phrygian cap, a classic Western symbol of liberty and freedom, with its wings intended to symbolize freedom of thought. Designed by noted sculptor Adolph A. Weinman, the Winged Liberty Head dime is considered by many to be one of the most beautiful U.S. coin designs ever produced. The composition (90% silver, 10% copper) and diameter (17.9 millimeters) of the "Mercury" dime was unchanged from the Barber dime. Weinman (who had studied under Augustus Saint-Gaudens) won a 1915 competition against two other artists for the design job, and is thought to have modeled his version of Liberty on Elsie Kachel Stevens, wife of noted poet Wallace Stevens. The reverse design, a fasces juxtaposed with an olive branch, was intended to symbolize America's readiness for war, combined with its desire for peace. Although the fasces was later officially adopted by Benito Mussolini and his National Fascist Party, the symbol was also common in American iconography and has generally avoided any stigma associated with its usage in wartime Italy. The 1916-D issue of only 264,000 coins is highly sought after, due largely to the fact that the overwhelming majority of the dimes struck at the Denver Mint in 1916 carried the pre-existing Barber design. Thus, the 1916-D is worth up to thousands of dollars if it is in relatively fine condition. A considerable number of common 1916 Philadelphia mint dimes have been altered with a "D" added, so buyers should be careful to purchase only from reputable dealers or to accept only sealed and graded coins. Be aware that any dimes that bear the date "1922" are counterfeit. Having possession of a counterfeit coin is illegal and can lead to its forfeiture. Many coins in the "Mercury" series exhibit striking defects, most notably the fact that the line separating the two horizontal bands in the center of the fasces is often missing, in whole or in part; the 1945 issue of the Philadelphia Mint hardly ever appears with this line complete from left to right, and as a result, such coins (designated as "FSB" for "full split bands") are worth more than usual for uncirculated specimens. A valuable variety is an overdate, where 1942 was stamped over a 1941 die at the Philadelphia mint. A less obvious, but still quite valuable, example from the same year is from the Denver mint. 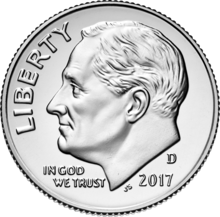 Soon after the death of President Franklin D. Roosevelt in 1945, legislation was introduced by Virginia Congressman Ralph H. Daughton that called for the replacement of the Mercury dime with one bearing Roosevelt's image. The dime was chosen to honor Roosevelt partly due to his efforts in the founding of the National Foundation for Infantile Paralysis (later renamed the March of Dimes), which originally raised money for polio research and to aid victims of the disease and their families. Due to the limited amount of time available to design the new coin, the Roosevelt dime was the first regular-issue U.S. coin designed by a Mint employee in more than 40 years. Chief Engraver John R. Sinnock was chosen, as he had already designed a Mint presidential medal of Roosevelt. Sinnock's first design, submitted on October 12, 1945, was rejected, but a subsequent one was accepted on January 6, 1946. The dime was released to the public on January 30, 1946, which would have been Roosevelt's 64th birthday. Sinnock's design placed his initials ("JS") at the base of Roosevelt's neck, on the coin's obverse. His reverse design elements of a torch, olive branch, and oak branch symbolized, respectively, liberty, peace, and strength. Controversy immediately ensued, as strong anti-Communist sentiment in the United States led to the circulation of rumors that the "JS" engraved on the coin was the initials of Joseph Stalin, placed there by a Soviet agent in the mint. The Mint quickly issued a statement denying this, confirming that the initials were indeed Sinnock's. The same rumor arose after the release of the Sinnock designed Franklin half dollar in April 1948. Another controversy surrounding Sinnock's design involves his image of Roosevelt. Soon after the coin's release, it was claimed that Sinnock borrowed his design of Roosevelt from a bas relief created by African American sculptor Selma Burke, unveiled at the Recorder of Deeds Building in Washington, D.C. in September 1945. Sinnock denied this and stated that he simply utilized his earlier design on the Roosevelt medal. With the passage of the Coinage Act of 1965, the composition of the dime changed from 90% silver and 10% copper to a clad "sandwich" of pure copper inner layer between two outer layers of cupronickel (75% copper, 25% nickel) alloy giving a total composition of 91.67% Cu and 8.33% Ni. This composition was selected because it gave similar mass (now 2.268 grams instead of 2.5 grams) and electrical properties (important in vending machines)—and most importantly, because it contained no precious metal. Since 1946 the Roosevelt dime has been minted every year. Through 1955, all three mints, Philadelphia, Denver, and San Francisco produced circulating coinage; production at San Francisco ended in 1955, resuming in 1968 with proof coinage only. Through 1964 "D" and "S" mintmarks can be found to the left of the torch. From 1968, the mintmarks have appeared above the date. None were used in 1965–67, and Philadelphia did not show a mintmark until 1980 (in 1982, an error left the "P" off a small number of dimes, which are now valuable). To commemorate the 50th anniversary of the design, the 1996 mint sets included a "W" mintmarked dime made at the West Point Mint. A total of 1,457,000 dimes were issued in the sets, making it the lowest mintage Roosevelt dime up to that time. Since then, the "P" mint mark 2015 reverse proof dime and "W" mint mark 2015 proof dime, minted at Philadelphia and West Point for inclusion in the March of Dimes collector set, have the lowest mintages with 75,000 pieces struck for each. Dime store, also known as a "Five and dime"
^ "US Mint Coin FAQ". Usmint.gov. Archived from the original on 2013-06-18. Retrieved 2013-04-13. ^ a b c d e Yeoman, R.S., A Guide Book of United States Coins (2004 edition), Whitman Publishing, 2003. ISBN 1-58238-199-2. ^ "Frequently Asked Questions" Archived 2006-08-20 at the Wayback Machine. The United States Mint. Retrieved July 19, 2006. ^ "1916-D Dime Attracts Coin Doctors and Counterfeiters! Retrieved September 9, 2010". Pcgs.com. Retrieved 2013-04-13. ^ a b c d Yanchunas, Dom. "The Roosevelt Dime at 60." COINage Magazine, February 2006. ^ "Conservatives want Reagan to replace FDR on U.S. dimes". USA Today. Retrieved July 12, 2006. ^ Churchill On Vacation, 1946/01/21 (1946). Universal Newsreel. 1946. Retrieved February 22, 2012. ^ "Stalin for Dime". Snopes. Retrieved July 12, 2006. ^ "Gometaldetecting.com". Gometaldetecting.com. Retrieved 2013-04-13. Wikimedia Commons has media related to United States dimes.